Containing unique active ingredient moxidectin for treatment of gastro-intestinal round worms and lungworm of sheep. Cydectin Sheep Drench has a persistant effect in preventing re-infection by Ostertagia spp and Haemonchus spp for 5 weeks and clinical trials have shown it is effective against certain benzimidazole resistant strains. Provides: Longest dosing interval 8 weeks, higher lamb DLWG, cleans pasture, environmental benefits and is the first choice to delay resistance. POM-VPS. A pale yellow solution containing 1 mg/ml moxidectin. Also contains the excipients benzyl alcohol, butylhydroxyltoluene and disodium edentate. Moxidectin is a second generation macrocyclic lactone of the milbemycin family. CYDECTIN 0.1% Oral Drench for Sheep has a persistent effect in preventing reinfection by Ostertagia circumcincta and Haemonchus contortus for 5 weeks and Oesophagostomum columbianum for 4 weeks. Clinical trials have shown that CYDECTIN 0.1% Oral Drench for Sheep is effective against certain benzimidazole resistant strains of Haemonchus contortus, Ostertagia circumcincta, Trichostrongylus colubriformis and Cooperia curticei. CYDECTIN should be given as a single oral drench of 1 ml/5 kg live bodyweight, equivalent to 200 μg moxidectin/kg live bodyweight using the CYDECTIN drench gun or any standard drenching equipment. To ensure a correct dosage, bodyweight should be determined as accurately as possible; accuracy of the dosing should be checked. If animals are to be treated collectively rather than individually, they should be grouped according to their bodyweight and dosed accordingly, in order to avoid under- or overdosing. Do not mix with other products. The effects of GABA agonists are increased by moxidectin. Resistance to macrocyclic lactones has been reported in Teladorsagia in sheep in a number of countries. In 2008, throughout Europe, moxidectin resistance is very rare; it has been reported in a single case involving a levamisole-, benzimidazole and ivermectin-resistant strain of Teladorsagia circumcincta. Therefore the use of this product should be based on local (regional, farm) epidemiological information about susceptibility of parasites, local history of treatments and recommendations on how to use the product under sustainable conditions to limit further selection for resistance to antiparasitic compounds. These precautions are especially important when moxidectin is being used to control resistant strains. Do not smoke, drink or eat when using the product. Wear impermeable rubber gloves during use. Protect from light. Do not store above 25°C. When the container is broached (opened) for the first time, using the in-use shelf-life which is specified on this package insert, the date on which any product remaining in the container should be discarded should be worked out. This discard date should be written in the space provided on the label and carton. Any unused veterinary medicinal product or waste material derived from such veterinary medicinal product should be disposed of in accordance with local requirements. Do not contaminate watercourses with the product. Dangerous to fish and aquatic life. Shelf-life after first opening the immediate container: 6 months. HDPE 1 litre jerrycan and 2.5 and 5.0 litre LDPE flexipacks. Not all pack sizes may be marketed. Moxidectin has been shown to be safe for use in pregnant, lactating and breeding animals. 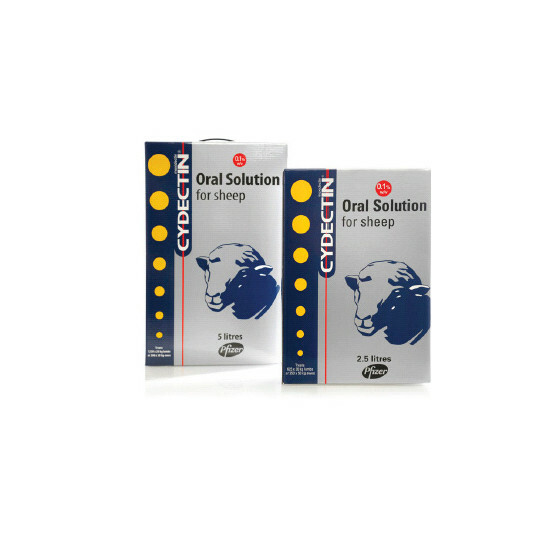 CYDECTIN 0.1% Oral Drench for Sheep has a wide margin of safety and symptoms of overdose do not generally occur at less than 5 times the recommended dose. They are manifested as transient salivation, depression, drowsiness and ataxia 8 to 12 hours post-treatment. Treatment is not generally necessary and recovery is generally complete within 24 to 48 hours. There is no specific antidote. CYDECTIN 0.1% Oral Drench for Sheep gives optimal pasture protection against stomach worms Ostertagia sp and Haemonchus sp, with an 8 week dosing interval–i.e. 5 week persistent activity, plus a 3 week interval from any re-infection to the presence of eggs in the dung. Treat at or around lambing to minimise the "spring rise", and pre-tupping, when rams should be treated also. After treatment, CYDECTIN 0.1% Oral Drench for Sheep continues to kill stomach worms picked up by the ewe for 5 weeks, thus substantially reducing pasture contamination. This "vacuum-cleaning" effect greatly reduces the worm challenge to lambs grazing the same pasture. The first dose should be given at around 4-6 weeks of age, with a second dose, if required 8 weeks later. Additional treatment may be required where there is a Nematodirus challenge. Treat lambs when a challenge is expected. CYDECTIN 0.1% Oral Drench for Sheep effectively controls Nematodirus at the time of dosing, but as with other available wormers does not offer a persistent effect against Nematodirus. Below are some recent questions we've received regarding Cydectin Oral Drench For Sheep, including answers from our team. Do I need a drenching gun specific to Cydectin or can I use any other make? Do you sell one I can use? You can use a Cydectin drench gun or any other standard drench gun. We sell Novartis drench guns which you could use.